Hello My Friends. I am happy. Really happy today. Why? Because it's my birthday and I just got the best gift EVAH!!!!! No it wasn't the new Iphone or new shoes or cake. Nope WannaME didn't get that. lol. It was even better. Yes, a rainy dreary Monday evening made my whole day wonderful. I was sitting here randomly clicking around the net when something told me to look outside. 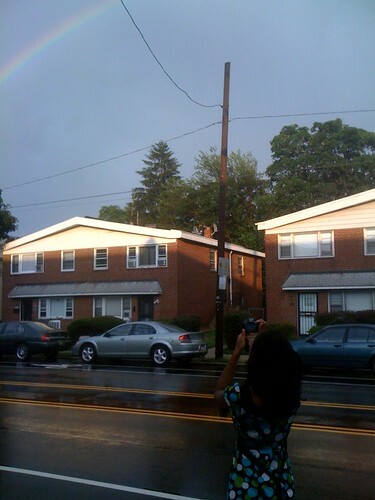 And when I did, I saw the most beautiful, colorful, brightest rainbow I've ever seen. And not just 1 but 2. And in that moment, all I could feel was that my Daddy and big brother Jamie were smiling down from HEAVEN and wishing me a Happy Birthday! And it made me want to dance barefoot in the rain. And I felt so much love. I hope you all get a chance to feel the happiness of dancing in the rain on a hot summer day, watching rainbows.